On 28th February 2017 the Inaugural launch of the Sir John Staples Society took place at Prendergast School on the occasion of the Leathersellers' Court Visitation. We were delighted to welcome Lord David Blunkett who gave a wise, witty and compelling speech to an invited audience of the federation schools' pupils, teachers, parents and guests. He was introduced by student speeches. The launch was a great success. Classical genius Wolfgang Amadeus Mozart and clarinet virtuoso Michael Collins share a birthday - 27th January - which was just two weeks ahead of the London Mozart Players’ own 70th anniversary. Federation students attended a special concert which marked this triple celebration, where Michael Collins performed two of Mozart’s acclaimed works at LMP's resident home, St John the Evangelist. It was a fantastic opportunity for students and a privilege to be able to attend. The students reported that it was a wonderfully enriching and beautiful concert. Students across the Federation attended the Varsity rugby match at Twickenham Stadium where Oxford and Cambridge students - men and women - met head-to-head at the home of England Rugby, Twickenham Stadium. The students were also welcomed by the admissions departments of the Universities of Oxford and Cambridge to present an insight into university life. This was an excellent day for our capable and gifted students making a real difference in terms of raising their aspirations to benefit from the quality of education at Oxford and Cambridge. Mark delivered an inspiring talk to sixth formers and some Y11 Prendergast Vale students on the 'Future of Creativity' bringing together lots of ideas from history, music, AI, creative practice and learning. Mark, a renowned jazz pianist, invited as part of his talk a sixth former to join him on the piano which was greeted with delighted applause! NHS England and NHS Improvement are working with Speakers for Schools to celebrate the 70th birthday of the NHS this year. The Federation was delighted to welcome Simon Stevens to Prendergast Ladywell School. Simon spoke to an audience of students from across the federation, inspiring them for careers in any of the 350 different jobs that 1.3 million staff undertake. A life changing talk from one of the most influential CEOs in England. Students from Y10 and Y12 experienced a 'Taste of Cambridge' in a visit to Fitzwilliam College on 11th July. After an Admissions talk, the students had a Q&A session and a college tour followed by lunch. The students were then able to select an Academic Taster Sessions in the Sciences or Arts. The Academic Taster Sessions were delivered by the University's Director of Studies in Medicine & Veterinary Medicine and Director of Studies in English. The visit was a valuable and aspirational experience for our students. A selection of Year 10 and Year 12 Students from the Leathersellers’ Federation of Schools undertook a visit to ‘Apprentice 2018’ on Wednesday 27th June 2018. This was an Apprenticeship event taking place at the Ravensbourne University to raise students’ awareness of the opportunities available for apprenticeships at all levels, including to degree standard. The students enjoyed an insightful and valuable day. Sir Brendan Barber was appointed as the Chair of the Advisory, Conciliation and Arbitration Service (Acas) commencing January 2014. He was the General Secretary of the TUC from 2003 to 2012 having first joined the TUC in 1975. He is a member of the Banking Standards Board, the Board of Transport for London and of the Council of City University London which he graduated from with a BSc in Social Sciences in 1974. He is also a member of the Board of the Mountview Academy of Theatre Arts. During his time at the TUC he sat on the Acas Council from 1995 to 2004, the Board of Sport England from 1999 to 2003 and the Court of Directors of the Bank of England from 2003 to 2012. He is a Visiting Fellow at the Said Business School, Oxford University, and a Visiting Fellow at Nuffield College, Oxford. In 2007 he received an Honorary Doctorate from the City University. Sir Brendan was knighted in the 2013 Birthday Honours for services to employment relations. Y10 students from Prendergast Vale attended a private viewing held in celebration of the opening of the Museum of London's London Nights Exhibition. London Nights reveals the capital at night with a display of over 200 works by 60 photographers, ranging from the late 19th century to the present day, some never seen before. The Exhibition runs until November 2018. Prendergast School's annual PrizeGiving took place on Thursday 12th October at Goldsmiths College. Professor Mark d’Inverno, the Pro-Warden and a patron of the Sir John Staples Society, gave an inspiring talk as Principal Speaker and a performance on the piano. It was a fantastic evening of celebration of the achievements of students who were joined by proud parents, governors and guests. Professor Mark d’Inverno was very impressed as were many parents and the school received lots of good feedback. Students from all 3 Federation schools had the wonderful opportunity of a trip on 18th September 2017 to The London Palladium to enjoy a superb performance of the 'Romantic Revolution' by the London Russian Ballet School. LRBS is a vocational charity which teaches ballet to and educates young people from widely diverse backgrounds. Its outreach performance work reaches over 3000 children from unprivileged backgrounds each year. LRBS is proud that leading Bolshoi principals will present an outstanding programme with its pupils. This is an incredible opportunity to see world class artists and for LRBS students to perform with them, accompanied by award winning musicians. LRBS is continuing its collaboration with the Bolshoi Theatre to bring ballet and classical music to young people. The trip was initiated by the Sir John Staples Society. The students from all the schools had a fantastic time. Andrew Parmley, the 689th Lord Mayor of London attended a wonderful concert of music at Prendergast School on 8th June 2017. There was Gospel and choral singing, classical duets and solos, singer songwriters, pop, soul and blues performed by students from all 3 federation schools. All the performers were under 15 and displayed an impressive level of talent. The Lord Mayor, himself a practicing musician, former Director of Music, patron of the London Symphony Orchestra and Head Master warmly congratulated the students. The performance was watched by Governors, parents and students from all of the schools in the Federation. The visit had been organised by the Leathersellers’ Company and its Master Mr Ian Russell. The visit was a further development of the Sir John Staples Society which supports interest in the arts, music, commerce, politics, religion and science amongst the students. Justin Webb made a big impression with the students who enjoyed the experience. Many were considering a career in Journalism because it sounded so exciting and varied. We are confident that he brought new directions and impetus to many. “Niall it was a real pleasure and I thought the kids were brilliant - bright and funny and full of questions. Did you all a great credit. The Inspectors should note! Stay in touch” Justin Webb. 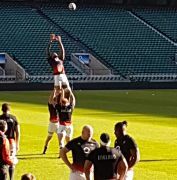 On Friday 17th February, Ross McManus, Head of PE Prendergast Ladywell School, took a group of students from the Year 8/9 rugby team to Twickenham Stadium to watch the England Men’s team in an open training session. None of the students he took had ever been to Twickenham before so they were all very excited about the opportunity. They had photos taken with mascots and the famous statues before taking their seats and watching the England team in action. There was a welcome from the Head Couch, Eddie Jones, who was about to lead the England team to a record 17 victories (and counting). The training session as you would expect was fast, furious and highly technical. The skills on display were very impressive and a great lesson to young players. All of the students thoroughly enjoyed the day and learned a lot. They will be better players for the experience and one day, you never know, it may have been the seed that grew into a future England player.